"Hold your children, come this way," she screamed as she led the group out a side door and through a gate away from the storm of bullets and carnage behind them. Once sure they were out of harm's way, Husna returned inside to help her wheelchair-bound husband. As she made her way back into the mosque, she was shot from behind. Killed. "It was a horrible scene … I saw blood, I saw people injured, I saw dead bodies, people in panic," he told the Herald today. "They were pushing one and other trying to get out - I thought 'how can I get out'. "Mentally, I prepared myself, I told myself to calm down and there was no point panicking - whatever will happen will happen." "I took the chance and I came out slowly and I was expecting that any moment I would be shot in my head from the back. "I gently came out further and got outside… my car was parked behind the mosque and I just went behind it and decided to stay there." "I could not see him [the gunman] but I could hear him … I could hear the shooting stopped for a few seconds and started again and I thought he was probably changing magazines, he did that about seven times. Fellow worshippers ran past him, scrambled over a fence to neighbouring properties and starting banging desperately on doors, yelling for help and sanctuary. "One friend of mine rang a couple of hours ago and he was crying and he said 'I saw you there but I left you'," Farid said. "I told him he did the wisest thing he could have done - I was in a wheelchair and I could not have jumped, and don't worry. "They were all desperate to get out - but for me, I did not panic." After about 10 minutes Farid was sure the shooting was over. "I had a feeling that probably, he had done his job," he said. "It was probably a stupid thing to do, but I could not think any other way at the time," he explained. "I wanted to check the ladies - and my wife. "As we went in I saw dead bodies, it was clear they were trying to come out and they were shot from behind and fell on their faces. "We went into the main room and the bullet shells were everywhere." Farid is a senior member of the mosque and for almost three years he gave sermons so he knew almost every face in that room - the dead, the dying, the injured. "I saw a man holding his son … terrible," he recalled. "I saw a man screaming 'please help me' and I saw he had two dead bodies lying on top of him - he asked me to remove the dead bodies and said 'I can't take it'." Husna Ahmed married her husband the day she arrived in New Zealand. Farid could not wheel himself any further into the room because the bodies strewn over the floor made it impossible for him to move. "An Ethiopian man called me and said 'can you help me, I can't breathe'... I saw one person breathing in a way that I felt he was going to die soon. "I found two people lying alive - one was a man from Bangladesh who I knew and he was supposed to be taking his two children and newly pregnant wife home to Bangladesh that evening. "He saw me and he said 'I'm finished' ... I saw a man from Palestine, bleeding profusely. "There were so many bodies …"
Everyone was begging Farid to help them, to tell them help was coming - asking where the ambulances were. He promised them "soon" and assured them all they would be okay, to hang on, to be patient and "everything would be okay". "Then the police came into the room and yelled at me 'what are you doing in here' and they took me out. One guarded me and one was helping me." Farid was taken to the end of the street behind the police cordon. He was frantically seeking information on where the women and children were - but all he could do was sit and wait. It wasn't long before a police officer called him, a friend who knew his wife well. He told Farid "you have bad news mate, go home". "I just thought I should tell you," he told Farid. Farid then had to go home and break the news to his 15-year-old daughter Shifa. Her school was in lockdown and she managed to find out her mother was missing and her father was safe. "When she got home I had to tell her. The worst part was when she said - are you telling me I don't have any mother?" Farid said, dissolving into tears. "I said yes ... But I'm your mother now ... and together we will face this. "I then had to advise my family, I decided to be strong and not break down because if I did, they would. "I said cry if necessary but do not allow your crying or emotions to break you mentally. "I was talking and talking and giving them lots of reasons why they should feel positive." Farid was proud of his wife, who spent most of her life working as a volunteer in the community and taught children at the mosque. "She gave her life to save other people and that was her last work," he said. "She took so many of them to safety and then she was coming for me ... I would describe her as somebody who was prepared to give her life for others." 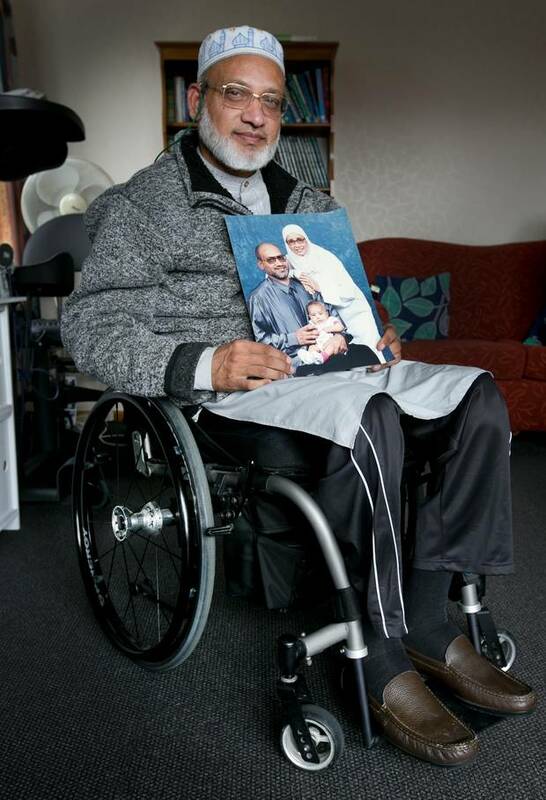 They moved back to Auckland after Farid's accident and he trained in homeopathy. "She had a wonderful personality," he said. "She was magnetic, very special - and a good mum. Farid was still reeling from the "calculated" attack that has ended at least 50 lives. "You cannot turn the clock back, but what we can do from now is we can either beat ourselves and suffer, or turn around and turn this experience into a better future," he said. "There is no need for anger - anger and fighting doesn't fix anything, but through love and care we can warm hearts. "I was asked 'how do you feel about the person who killed your wife?' and I said 'I love that person because he is a human, a brother of mine," he said. Farid said last night when he could not sleep his thoughts turned to the gunman. "I was trying to grieve and it came to me then that I wish I could give him a hug, I wish I could meet his mother and give her a hug and say 'you are my aunty'. "I wish if he had a sister I could hug her and say 'you are no different than my sisters'. "You are still alive, you have a chance," he said. "Every human has two sides - evil and humanitarian; bring out your humanitarian… instead of killing and hate … I wish i could say that.